Pregnancy is different for every woman. Some women undergo drastic changes while others less so. Your body, however, is certainly going to change. This means that the clothes that you own are no longer going to suffice. You are going to need a new wardrobe. This is not only true for your pregnant body but also after you have delivered. You may be able to get away with wearing slightly larger clothes for the first few months. After that, however, you are probably going to have to pick out some maternity outfits for yourself. Here, comfort is key. You definitely still want to look nice but you are also going to need clothes that will provide you with a great deal of comfort. This means picking out things that are made from breathable material, are stretchy, and are not too tight. If you do not want to invest in too many maternity clothes, you can always opt for clothes with adjustable sizing. This will help to increase or reduce the size as needed at different stages. You are going to need clothes that will help you with the uniquesituation that you are in. Namely, you will need clothing items that will help you feed your baby on the go. The best option for this are breastfeeding dresses and tops. 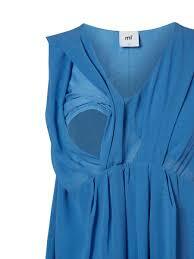 This is because such clothing comes equipped with an easy to remove or unbutton function. This makes it a lot easier to feed your baby when you are not at home. Rather than struggling with regular clothes, you should consider investing in a few nursing items as well. One thing you are definitely going to be needing is new bras. Your old ones will be essentially useless when it comes to reigning in your new assets. It is best to choose bras that are specifically meant for your burgeoning chest as you will require a great deal of support. You are also going to be needing nursing bras. This can be easily unlatched so that you will be able to breastfeed your little one a lot more easily. Shopping for your pregnant belly as well as your post-delivery one may be an unusual experience. As long as you have all of the necessary items, you will be able to mix them and come up with some wonderful outfits.